Has it only been three weeks since we returned from Montana, Idaho, and Wyoming. It feels like yesterday that I was fighting a large german brown on the Beaverhead. The smoke from all the fires was clinging to the ground, much like the smog was yesterday late afternoon. I like the Beaverhead best as it was the last river we fished before heading home. The Beaverhead river is a tailwater fishery, meaning that the flows are fairly constant and there are some big fish lurking almost everywhere. It begins just north of the Clark Canyon Reservoir. It is no larger than twenty to thirty feet across, but the water runs clear and fast in this section. 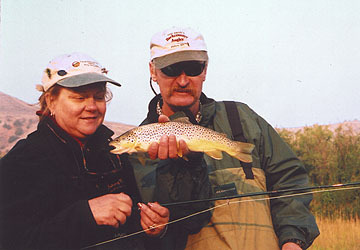 We were on the water early with Tom smith, guide and owner of the 'Backcountry Angler', a fly shop in Dillon, Mt. He had been recommended by a friend of Bobbie Armor's, Greg Lilly of Healing Water's Lodge, near Twin Bridges, Montana. Tom's idea was to get on the water early to beat the crowds and to match the hatch of large, and I mean large, Crane Flies. The idea as explained by Tom, to tie on an adult Crane Fly as your indicator, using number 1 or 2 tippet and eighteen inches below that a Crane Fly emerger. A deadly combination. Casting the combination on the water, making as much of a disturbance as possible. (The Crane Fly flits along the surface of the water, occasionaly dropping a leg into the surface film, thus the dragging). My First strike was startling as the fish attacked that fly like a bass for a popper. Water, algae and muck, all exploded skyward as the fish headed for deep water. 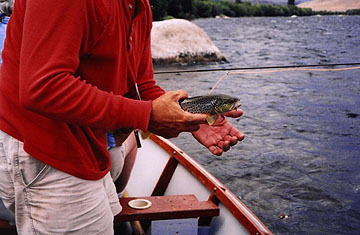 The fish came to the net, was photographed and released. One thing about those big Montana Browns is that they are not leader shy. We used 1X or 2X, and fought for quick fights and easy releases. Bigger fish got their pictures taken, then released. One of the pleasures of getting on a river, any river is the wildlife that one sees besides the fish. In the case of the Beaverhead it has moose, eagles, herons, and beavers. The fishing was great early in the morning thru lunch. The afternoon proved something of the same until we made a competition out the type of indicator fly. Bobbie had wanted to use a black and yellow Bumblee pattern, while I used a Hopper pattern. Mainly a Dave's Hopper, or a Madam X. I was willing to change around so long as it was a hopper. It was size and color that interested me. The idea was to see which fly took the most fish. As it turned out, though we had many fish strike the top fly, it was the emerger that took all the fish caught in the afternoon. My one complaint about the whole trip, whether we were fishing on the Henry's Fork, the Madison, or the Beaverhead. The guides didn't like us using our own flies. As long as we used patterns that they were used to, it was fine, but... Now I don't tie many flies anymore, but I have lots of flies and I want to use my own more often than not. 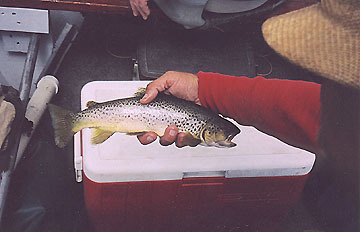 (Ted Adachi told me that the big brown he caught on the Henry's Fork this year was caught on one of his own flies. Now I may not catch a 14 pound fish, but I want to try. I will make it a point to fish at least part of the time with flies of my own making or owning and the guide be damned. (Who is paying for the trip anyway). If you go give Tom Smith a call. His Montana number is (406) 683-3462. Byt the way he also guides in the Florida Keys, mid December til May. In Key Largo his number is (305) 451-0895.